Former House Speaker Newt Gingrich celebrates the 200th anniversary of Abraham Lincoln's birth by channeling the 16th president for advice on dealing with the current state of our Union. In an exclusive essay for Newsmax magazine, Gingrich and co-author William Forstchen write about Lincoln's remarkable character, the crises he faced, and the enduring lessons today's troubled America can learn from him. President Barack Obama likes to compare himself to Abraham Lincoln - indeed, much like Lincoln, Obama faces the daunting task of leading a nation in peril. 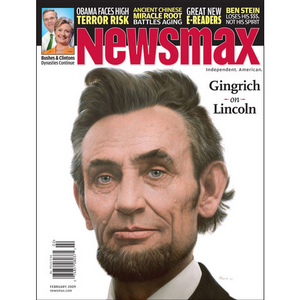 Gingrich reveals what Lincoln would say to Obama and his fellow Americans today. Gingrich is one of the GOP's most noted spokesman and thinkers. He is well known as the architect of the "Contract with America" that led the Republican Party to major victories in the 1994 congressional elections, and is the author of 10 New York Times best-sellers. Lincoln's belief in American "exceptionalism"
How Lincoln presaged the words of Martin Luther King Jr.
Slavery and the "stench of hypocrisy"
Lincoln's shift on race — flip-flopping or maturing? Gen. Ulysses S. Grant's unpopular troop "surge"
Special Bonus: If you are not a Newsmax magazine subscriber get this edition PLUS a 3 month free trial subscription to Newsmax magazine — a value of $15!